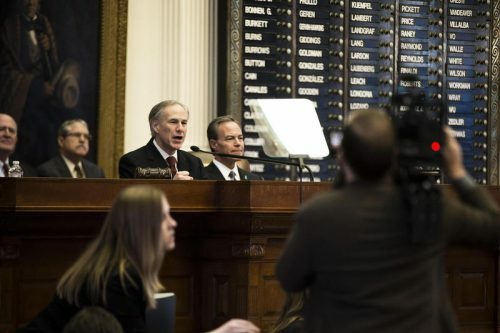 In a joint address to the Texas House and Senate, Abbott will outline issues he expects lawmakers to address before they adjourn in May. Last month, Abbott, along with Senate leader Lt. Gov. Dan Patrick and Texas House Speaker Dennis Bonnen, pledged to fix the state’s “woefully inadequate” school finance system. Lawmakers in both houses have also called for the state to whittle down how much the state collects in taxes from property owners. In the interim, Abbott also pledged movement on school safety, after the state saw two of the deadliest mass shootings in its history at Sutherland Springs and Santa Fe High School. You can watch a livestream of the speech below. This entry was posted in KRTS News and tagged Gov. Abbott, State of the State. Bookmark the permalink.